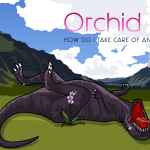 Tis the season for leaves to fall on your well-kept lawn, which might make you not so jolly. 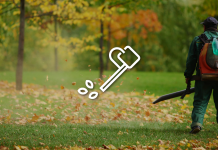 While the image of dry, dead leaves scattered across your yard may make you dread the fall season, one glance at some lawn sweeper reviews might just cheer you up. Lawn sweepers are great tools to own, especially during the autumn and winter seasons, because they remove leaves, twigs, needles, and even pine cones effortlessly. 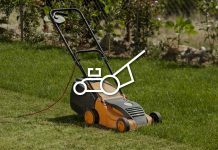 These devices can lighten the burden of yard work since they eliminate the need for strenuous manual labor. 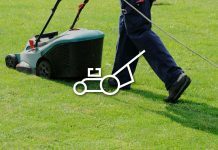 What’s more, mechanical sweepers can get the job done fast, meaning that you spend less time cleaning your yard and more time enjoy enjoying it. 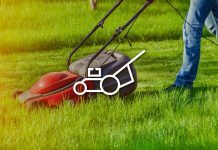 What is a lawn sweeper and why do I need one? 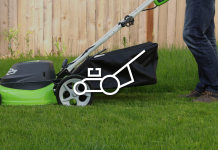 Think of a lawn sweeper as a vacuum machine for your yard. 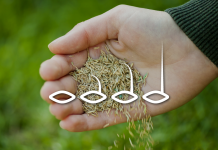 Although operation can vary, most sweepers apply the same principle to eliminate unwanted debris. These machines can either be pushed, like a push mower, or towed. As the yard sweeper moves along it will pick up lightweight matter, such as twigs and leaves. While you can use a rake to collect leaves (or, if you’re especially adventurous, a backpack leaf blower), this particular tool takes the hard work out of the equation. You wouldn’t go around trimming every area of your lawn with a pair of clippers, when you could just use a mower. 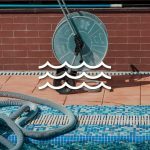 Using a rake can be similarly laborious and unnecessary when you have a relatively inexpensive option to simplify the process. 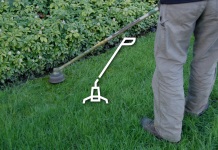 Read the following lawn sweeper reviews to find the best lawn sweeper to buy for your yard. If you’re looking for a sweeper that is both lightweight and easy to store, you might just find your new best friend in the Agri-Fab 45-0218 26-Inch Push Lawn Sweeper. 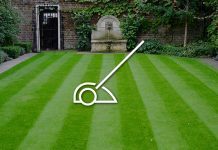 Perfect for smaller yards, this product is the best push lawn sweeper, and is expertly crafted to collect leaves and grass clippings in minimal time. With a bag capacity of 7-cubic feet, you won’t have worry about constantly dumping out the bag either. The level on this model can also be adjusted, so it can pick up the majority debris on a well-maintained lawn. 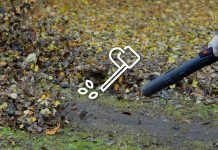 Keep in mind that while a leaf sweeper can be a useful tool, it isn’t designed work on wet grass, or to pick up wet leaves. Most products of this caliber will struggle to handle damp debris. 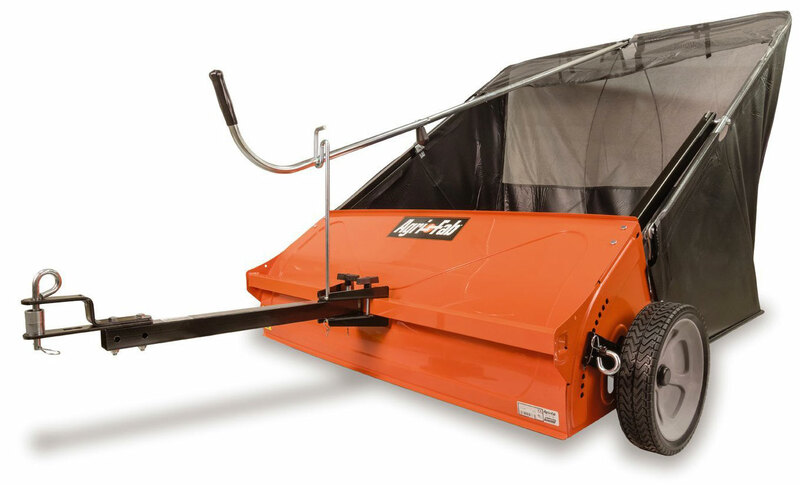 The collapsible Agri-Fab 45-0492 Lawn Sweeper is a great option for those who want a durable and dependable product. Thanks to Agri-Fab’s “flow thru” technology, the sweeper’s hopper gets completely full before having to be unloaded, which allows you to get more done. While this model is on the pricier end of the spectrum, this towable yard sweeper has multiple convenience features that save you time and effort. The best user-friendly features of this product include a 25 cubic feet mesh hopper bag and a dump lever that can operate from your tractor seat. Built to pick up the maximum amount of debris in the first pass, this product features a 20 cubic foot hamper and 6 brushes that can be easily adjusted to the height that works best for you. 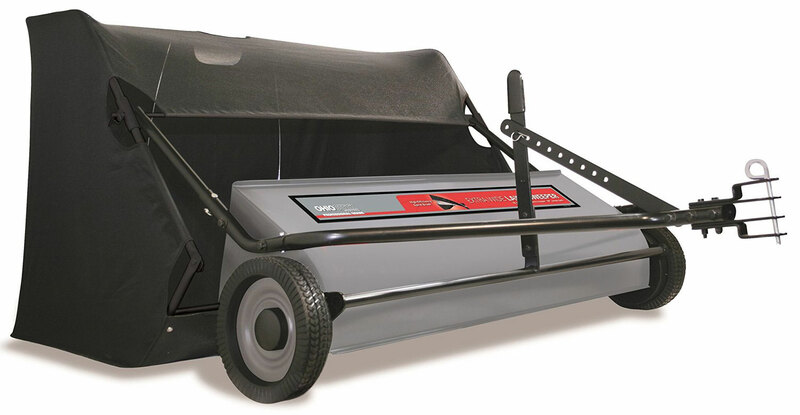 Looking for the best lawn sweeper on the market? The Brinly STS-427LXH is among the finest. 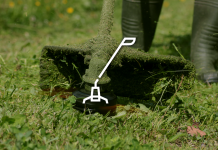 The product’s high quality and unique design means that it picks up more debris in less time, which saves you the hassle of sweeping over your yard multiple times. Many lawn sweeper reviews rave about this sweeper because it’s a top quality product designed to save the user time and effort. Effective in almost any kind of back yard terrain, this product is a high performance grass sweeper that is easy to use and efficient. As the best lawn sweeper for leaves, this machine is ideal for larger yards, and can complete the job in as little as 30 minutes. However, this 50” sweeper doesn’t collapse, making it a good fit only if you have the storage space. 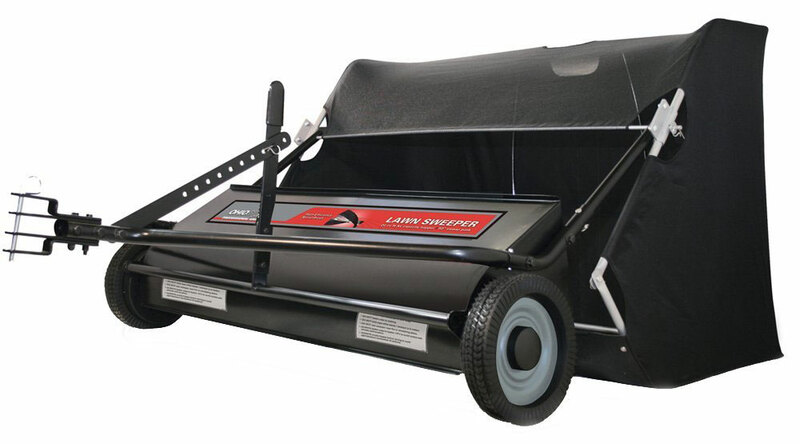 What really sets this leaf sweeper apart from other products is the fact that’s backed by a 3-year warranty. Even better, the Ohio steel 42SWP22 sweeper is designed to last. The trademark spiral brush is engineered to be highly effective, which save the gears from over exertion. It also features an extra wide shoot to protect the machine from clogging, and a collapsible hamper. How to use my lawn sweeper in the most effective way? 1. Always make sure your grass is dry before operation. 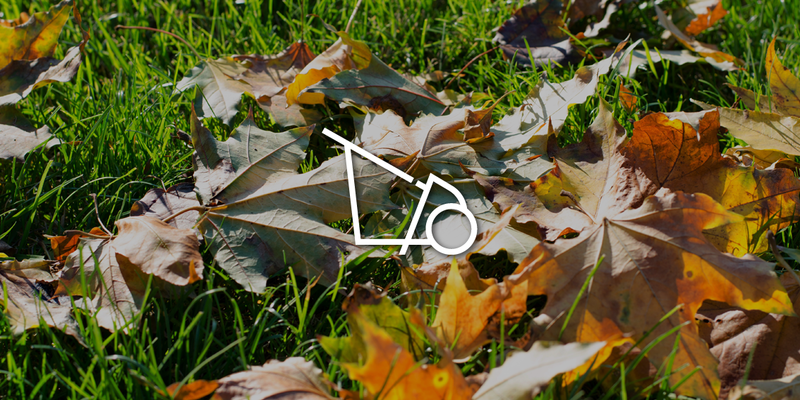 Moist leaves or wet grass are harder for the sweeper to pick up. 2. 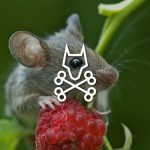 Avoid fast speeds. The faster you go, the less debris you’ll pick up. 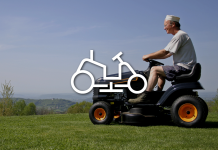 Find a moderate speed that works well for your tractor and your sweeper. For hilly yards, it’s important to go slow so that your sweeper can gain traction on the ground and not miss sections. 3. Empty the Hamper regularly. 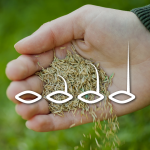 To really get the most out of your sweeper, you need to empty the hopper on a frequent basis, which can range anywhere from once every use to 3 or 4 times per session. 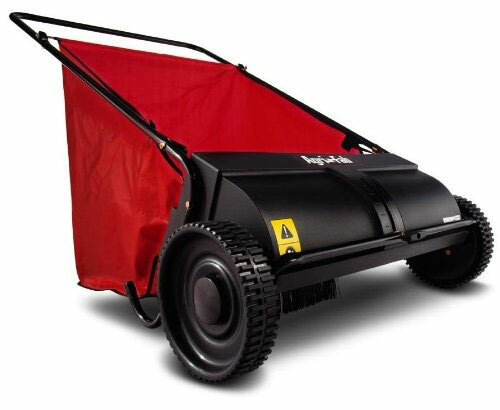 Push Sweepers: some models are hand-powered, while others can be electric or gas. These types of sweepers are lightweight and easy to use, but are typically more ideal for smaller yards. 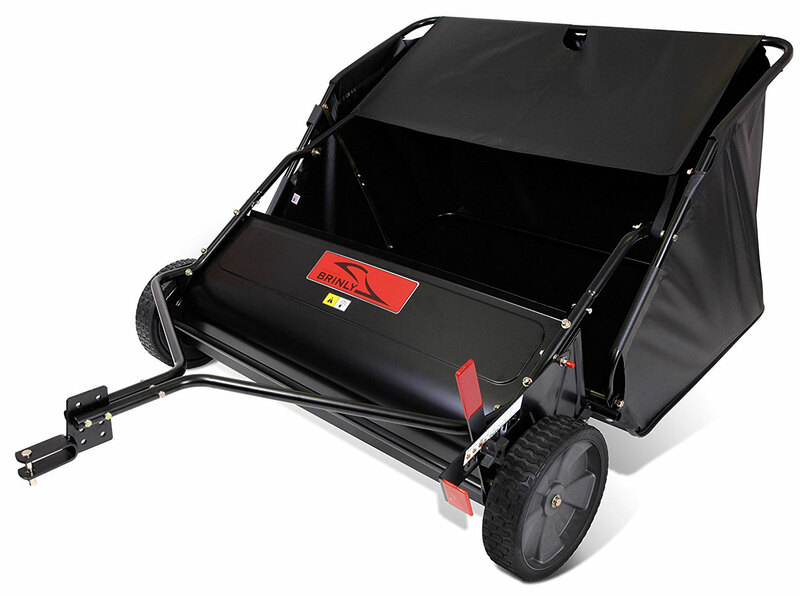 Attachments/ Tow sweepers: You can purchase a sweeper attachment as part of a riding mower or lawn tractor. This kind of sweeper is the best lawn sweeper for grass clippings since its designed to trail behind a mower. 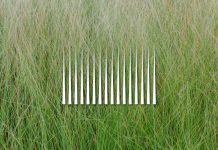 Though fake grass is growing in popularity, you might not be ready to replace your lawn with a patch just to cut down on the amount of effort you put into raking. If you’re looking for a time saver (and maybe a back saver) buy yourself a lawn sweeper. 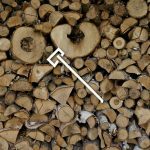 To find the best sweeper, you want to consider the size of the yard, and whether you need additional functions, like a shredder. Remember that your sweeper will also require occasional maintenance. With proper care, and sweeping on a regular basis, you’ll always have a well-kept yard with minimal effort on your part to maintain.